Gibson Sotheby's Closes South Boston Office! Gibson Sotheby's Closes South Boston OfficeSo I was driving up West Broadway in South Boston this morning. 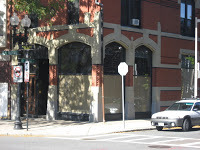 As I drove by what used to be the second nicest South Boston real estate office, I noticed Gibson Sotheby's had shut down their South Boston branch. FYI, the nicest office is ours! As the economy continues to under perform, you will see more real estate offices and other business' consolidate their offices. It's interesting because I was reading an article the other day about this topic. Follow the link below for more on real estate consolidation.